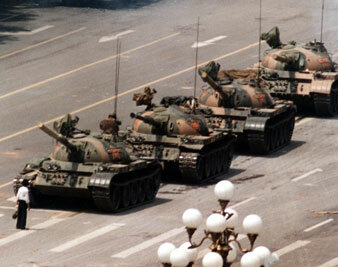 20 years ago the Chinese army began its violent crackdown on the Tiananmen demonstrations. Since last month, the internet censors in China have been curtailing access to websites such as Youtube and blogger (which is why it’s been difficult to update this blog) and Flickr, Twitter and more recently BBC news reports that refer to Tiananmen. The period is being referred to as Chinese Internet Maintenance Day, since many websites are closed ‘for routine maintenance’. Of the many articles I’ve read about the situation, I was struck by this one in the The Nation which features the famous image of a lone man confronting the tanks on Changan Jie (there’s video footage of the same event on the Guardian website. In April and May of 1989, people around the world were inspired by the protests in Tiananmen Square, then horrified when the June 4 massacre turned Beijing streets into urban killing fields. China has changed enormously in the twenty years since then, but the Communist Party’s attitude toward 1989 has remained constant. It insists there were no peaceful protests and no “massacre,” just “counterrevolutionary riots” that were pacified by soldiers who showed great restraint. It refuses to acknowledge the losses to relatives of the hundreds of victims, tries to keep young Chinese ignorant of what happened and encourages specialists in the West to stop dwelling on 1989. This approach is part of a larger effort to change the image of the party, so that mention of its name does not bring to mind visions of the Red Guard of the 1960s, anti-Confucian rallies of the ’70s or the iconic picture of the lone man confronting a line of tanks. Instead, party leaders would like it to be associated with skyscrapers, sleek department stores and refurbished Confucian temples. These pictures fit in better with the party’s view of itself as a pragmatic organization that has moved China forward while honoring traditions, transformed cities into showplaces of modernity and raised the nation’s international status and living standards. The 2008 Olympics, seen in this light, was the most expensive rebranding campaign in world history. What resonates with me is the connection the article makes between the image of the lone figure and the image of ‘skyscrapers, sleek department stores and refurbished Confucian temples’. I’m not brave like that man in front of the tanks, and because I’m not brave, I can only stand or dance in front of the battalions of buildings which are somehow connected to the same totalitarian energy that drives a tank. When we performed in Beijing for the Dadao Live Art Festival in 2007, I didn’t perform on Tiananmen, but by sneaking on to the Olympic building site and dancing in front of the Bird’s Nest Stadium, I wanted to pay my cowardly homage to the lone individual who can stand in front of tanks.